One of the many side benefits of doing what I do for a living is that I get to meet people all over the state who want me to try or taste a little something that's dear to them. We ordered 5 pounds of cayenne peppers from Mr. Randal Rodriguez to make my friend Debbie's delicious chow chow with during my stay with her in Breaux Bridge last weekend. (Cajun chow chow is made with cayenne peppers ground with a few secret ingredients and pickled in vinegar.) Mr. Rodriguez wouldn't take payment, wanted me to taste his home-grown produce. I have never seen such big, beautiful cayennes! If you find yourself anywhere near the area, contact him for fresh produce- corn, peppers, okra, etc. You'll find more information on his Facebook page here. Now I'm making plans for what to do with 12 half-pints of chow chow. It'll be ready to eat in a few more days, and a select few of my friends may get lucky. Meanwhile, I put some of the candied jalapeños lefet over from the July/August issue on my Creole tomato BLT last night... The old-timers say eating hot peppers in the summer helps keep you cool, something that is very welcome in south Louisiana in July. The hotter, the better, I say. Enjoy this week's recipes, share them with family and friends, and, as always, let me know what's on your mind. Have a great weekend. Looking for a specific recipe? We have over 1,500 on our site. Click here to browse. P.S. Our paid magazine subscribers allow us to keep sending you this email for free. If you enjoy it, you will love the magazine! Subscribe today and receive your July issue next week. Shipping Now. Order today and get your copy next week; click here to preview. 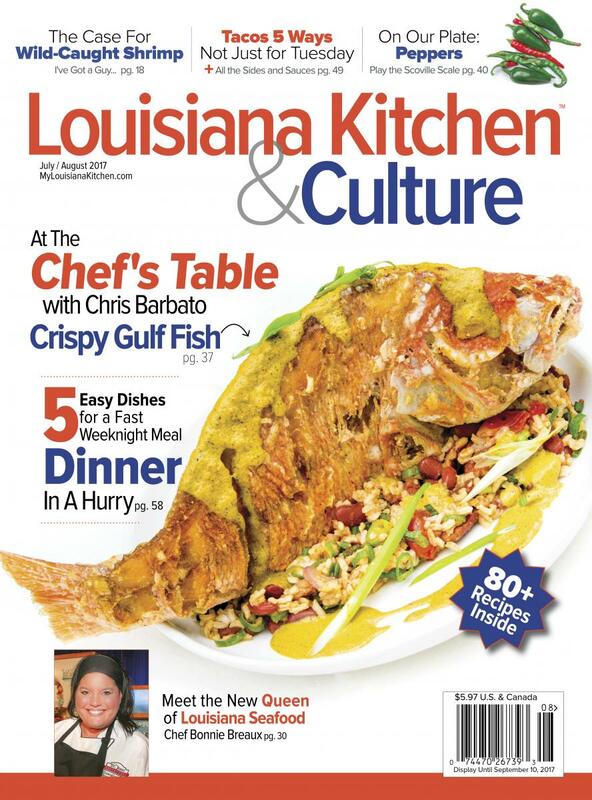 Click Here to find Louisiana Kitchen & Culture on a newsstand near you. or call 504-208-9959.What is that, you ask? Every issue since we started (over 1600 reciipes plus stories and articles that celebrate Louisiana's unique culture, heritage and cuisine). This is from Chef John Folse's After the Hunt; it calls for Creole tomatoes, but use any ripe, bursting-with-flaver summer tomato if you don't have access to Creoles. 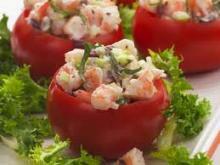 This calls to serve it as an appetizer, but I use big tomatoes and call it an entrée perfect for a hot day. Chef Paul Prudhomme made personal dietary changes in mid-way through his career and lost a lot of weight -- but of course in a tasty manner. He published Fork in the Road in 1993, and it is an impressive collection of flavor-packed recipes that are very healthy. He offers an interesting technique for de-fatting any stock; you'll find it linked from the tip at the end of my note above. This is a quick, flavorful dish perfect for a hot summer night; the marinade doubles as a salad dressing, and can also be used on chicken, shrimp, or fish steaks. Don't marinade fish or shrimp for more than 8 minutes as the acid will begin to 'cook' the delicate flesh. Join us on Facebook and help spread the word about the magazine and reach our goal - 5000 fans. Click, it's that easy. Enjoy this newsletter? You can help us grow. • Tell your friends about the magazine and web site. • Subscribe to Louisiana Kitchen & Culture magazine. • Email us your ideas & suggestions.